The world is different than it was even a decade and a half ago as we celebrate Memorial Day. We have troops in countries now that we didn’t have then, and after 9/11 we now remember why we fight. The History Channel often re-runs the HBO series Band of Brothers, the adaptation of the Stephen Ambrose book about a company of soldiers from the landing at Normandy through the end of the World War II. During WWII my father crossed paths with the Company E mentioned in “Band of Brothers” while liberating the Dachau Concentration Camp. My father’s story was originally told in part on HBO’s website during the 2001 premier, regarding the episode entitled “Why We Fight” on the liberation of Dachau and its many subcamps. His full story is told in pictures at billpetro.com/johnpetro. He rarely volunteered to me information about the War, but when I did ask specific questions, he would answer. He left me pictures taken during the liberation of Dachau. Ironically, during a visit to Dachau, when I told the workers at this modern memorial that my father had participated in the liberation, they all asked me the same question: “Do you have pictures?” I still have these pictures of those who survived, who looked like skeletons. I also have pictures of the skeletons of those who did not survive, of the open boxcars with bodies piled high. 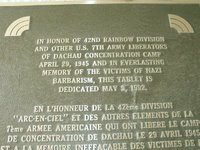 At the end of the tour, when I stood before this plaque attached to the tunnel leading up to the gate shown above, even with the school children running around playing in the yard on their field trip day, I wept as I considered the bravery of my father’s group, Rainbow Division, one of three divisions that liberated the camp. 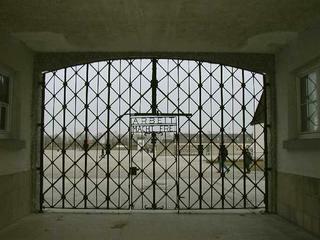 I tell the story of the history of Dachau in my 3-part series written upon the 70th anniversary of its liberation here. These gruesome images must never be forgotten. It must never be forgotten what barbarism man is capable of committing toward fellow men. But some may say, “I don’t want to think about it, surely no one believes that these atrocities were justified, that they’d ever be repeated.” But only three decades ago, an organization asked to use University of California conference grounds property for a meeting. This request was later denied when it was learned that the organization requesting the facilities maintained that the Holocaust was a hoax, that it did not really occur. There was also a corresponding outcry that this organizations’ free speech rights were being violated. I hate to nitpick, but where are these multiple wars? We left Iraq two years ago. Thanks for the note: nitpick? I love nitpicking! Why do you assume I was referring to Iraq? Since last year, we’ve had troops or planes in Jordan, Turkey, Chad, Mali and Somalia. And that does not even count US stealth bomber flyovers of N. Korea. Technically, America has not declared war since WWII. Only Congress can formally declare war, and that hasn’t happened since then. Even Korea was not a war, it was a UN Police Action, at least according to President Truman. The only things close to a “state of war” was our invasion of Panama in 1989 but that was against a criminal rather than a belligerent, and the War on Terror which Congress authorized the President to fight in 2001. Perhaps I should change my article to refer to major conflicts.